Federal authorities are just in the beginning stages of their criminal investigations. If past corporate criminal investigations are any indication, internal email and memos from conscientious Boeing engineers and executives are sure to emerge further implicating the company and its executives. But evidence is not enough to successfully bring corporate manslaughter prosecutions. That’s because there is a political economy of corporate criminal prosecutions that favors the powerful. And that’s one reason why we see so many manslaughter prosecutions against ordinary Americans, and so few against powerful corporations and executives. Boeing is one of the most powerful corporations in the United States. In Washington, Boeing flexes its political muscle with a couple of dozen in-house lobbyists and another twenty or so outside lobbying firms. Boeing spends $15 million a year on lobbying and donated about $4.5 million to congressional candidates and other political committees in the 2018 midterms alone. Boeing also exerts influence in media circles. Let’s take the case of Meet the Press with Chuck Todd, perhaps the most influential Sunday talk show. There has not been one mention on Meet the Press of the Lion Air’s Boeing 737 Max 8 crash off the coast of Indonesia that killed all 189 passengers and crew on board since that crash on October 29, 2018 — not one mention in the 26 episodes of Meet the Press since that crash. 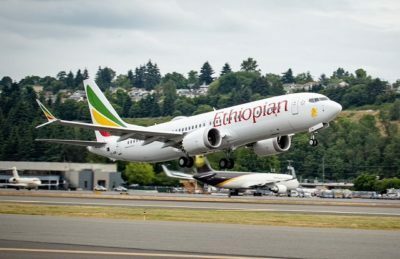 There has not been one mention on Meet the Press of the Ethiopian Airlines Boeing 737 Max 8 crash near Addis Ababa killing all 157 passengers and crew on board in the six Meet the Press shows since that March 10, 2019 crash. The only mention of Boeing during any of those shows is an announcer saying that Boeing is a sponsor of Meet the Press. Manslaughter prosecutions in the United States against corporations are rare, and when they happen, they are mostly against small businesses. There are exceptions. In 2013, BP was forced to plead guilty to manslaughter in connection with the deaths of 11 workers who died in the 2010 explosion and fire on the Deepwater Horizon rig in the Gulf of Mexico. Like BP, the Boeing case is an exceptional case. There is no need to rush to judgment against Boeing. Prosecutors should take their time in prosecuting Boeing and responsible Boeing executives for manslaughter. Civil and criminal fines, tort claim settlements, deterrence and rehabilitation are not enough. Criminal prosecution is society’s strongest signal against anti-social behavior. It says — we believe what you have done is morally wrong and as a result, 346 innocents are dead. Justice must be done. Prosecute Boeing and the responsible executives for manslaughter. Then let a jury decide on guilt or innocence. It’s the American way.